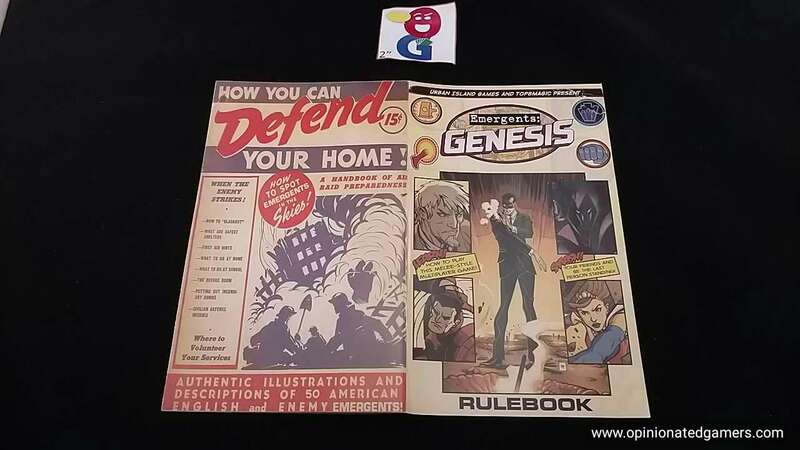 Emergents: Genesis is a superhero/comic themed game set in a unique universe created by Brian David-Marshall. In this world, Emergents are budding superheroes that have decided to fight each other. That battle is what takes place in this game. The game is a PvP deckbuilding battle royale. For those of you who are familiar with the deckbuilding genre (Dominion, Thunderstone, etc. ), many of the concepts will feel very similar. Each player starts the game with an Emergent Avatar card – this gives you your identity as well as your special power in the game. There are four different classes of Emergents in this world, and each has a different way they can take advantage of the game rules. 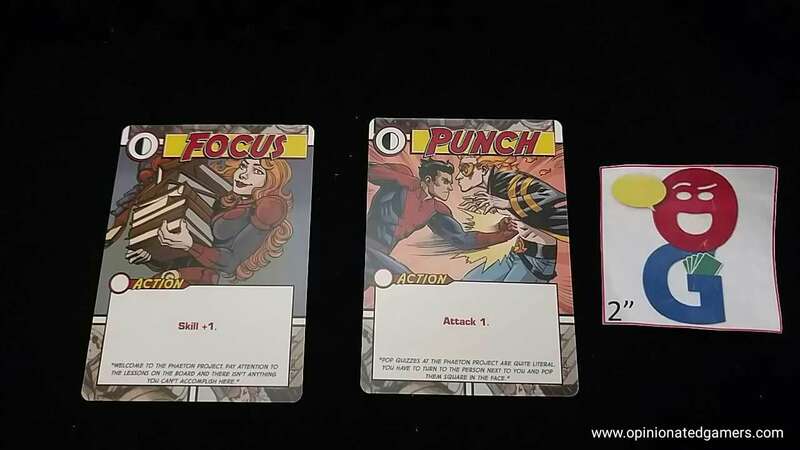 In addition, each player gets a starting deck of 12 cards – 9 Focus cards and 3 Punch cards. These are shuffled and a hand of 6 cards is dealt. The Focus cards give you +1 Skill; Skill is the currency of the game, you will use this Skill to buy new cards to add to your deck. The Punch cards give you +1 Attack; Attack is the…Attack in the game. You target other players with this Attack, and your chosen foe will have to defend against this or take damage. As far as Damage goes, each player gets a HP tracker, and then scurries around the game room to find some suitable marker to use on this track. (In our game room, you just go find a few polyhedral dice to use for markers). The rest of the tableau is separated into two parts. In one area, you have “The Panel”. Here you will find copies of four basic cards: Can’t Stop, Clear Mind, Oust and Tackle. Each of these relates to the special power of one of the four avatar classes. However, the cards here are available to all players in the game. The bulk of the cards in the game (non-Starter, non-Panel) are then shuffled to form the Book. The top six cards of the Book are flipped up to form the Page. 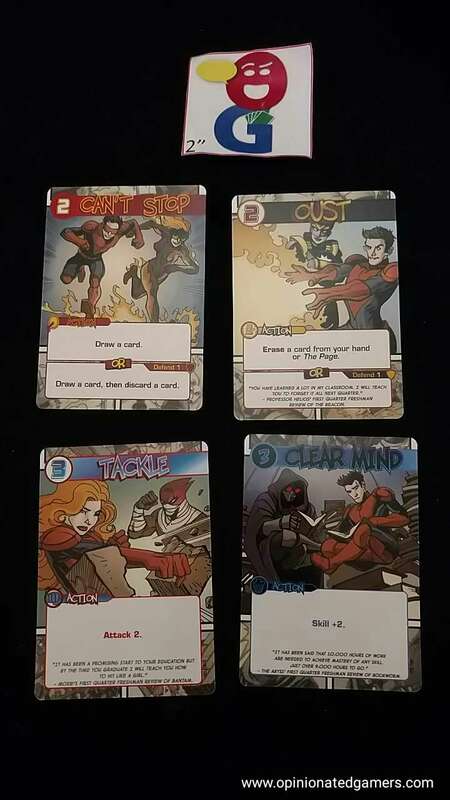 There are two basic types of cards in the book – Action cards (which are played on your turn and then discarded) and Gear cards (which are played on your turn and then stay in front of you on the table until something causes them to be moved). A start player is chosen, and before the game starts, that starting player loses 3HP (to balance things out). On a turn, you can do any number of things until you run out of cards. You can play cards to the table to generate Skill. You can then use this Skill to buy new cards from the Page or the Panel. The purchase price for the cards is in the upper left corner. You just keep track of your Skill in your head, and then subtract away the cost of the card. The newly gained card goes onto the top of your discard pile. You can also play a Gear card to the table. Once played, it is immediately in effect. Once a turn, you can use the Action printed on a Gear card. You can also use the action on your Avatar card once a turn. You can play a card to generate Attack. When you do, you pick a target for the attack and then resolve it immediately. When you attack someone, you read the main action of the card and then direct that damage at another player. That person now gets a chance to defend. Many of the cards have a secondary action (always at the bottom of the card) that has a Defend value printed in that box. The defender can choose to discard a Defend card to block damage up to the number printed on the card. If there is excess Attack after the Defend is subtracted, then the defender takes HP loss equal to the excess. The Defender could also play a Counter card. 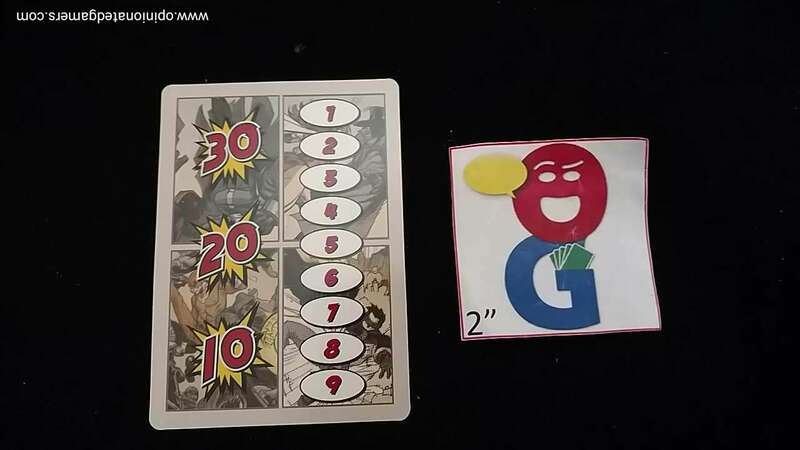 The Counter card not only blocks damage up to the number printed on it, it also then returns an Attack onto the original player equal to the number on the card. The original attacker now has a chance to play his own Defend or Counter in response. The battle goes on until everyone has had their chance to appropriately respond and there are no further options for response. Your turn ends whenever you decide it’s over – though this is usually when you’re out of cards. Like many deckbuilders, you pretty much lose everything at the end of your turn. You discard all unplayed cards, you lose any unspent Skill points, all the Action cards played this turn also go to the discard pile. Note that Gear cards remain on the table in front of you. Then you draw a fresh six card hand from your Deck. If you have no cards left in your Deck, you immediately shuffle your Discard pile to form a new Deck. The next player then takes their turn. This continues until there is only one player left with HPs. That player is the winner! If you are reduced to 0HP, you are eliminated from the game and you just have to wait until the next game to do something. 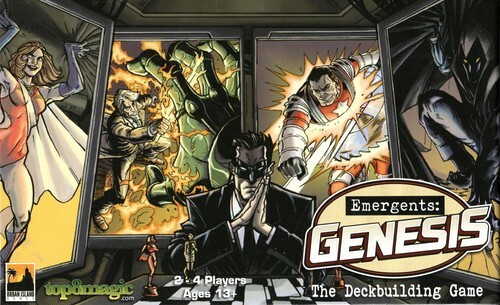 Emergents: Genesis is an interesting take on the deckbuilding genre. Unlike many of the other games in the class, this one doesn’t really go for variety of setup – instead it is really a fighting game that happens to use deckbuilding as a mechanism. The goal here is not to accumulate the most victory points, but rather just to survive the longest. The game gives you a six-card hand, which is nice because you will find yourself discarding a fair number of cards to Defend or Counter attacks. In fact, this decision is one of the central mechanisms in the game because if you use a card for its Defense value, you discard it from your hand and you will not be able to use it for its main Action when your turn comes. There is a nice balance between playing cards in response to attacks versus saving them for your own turn. There are a number of different actions on the cards in the Book – and there is a decent Glossary in the rules to help explain them. 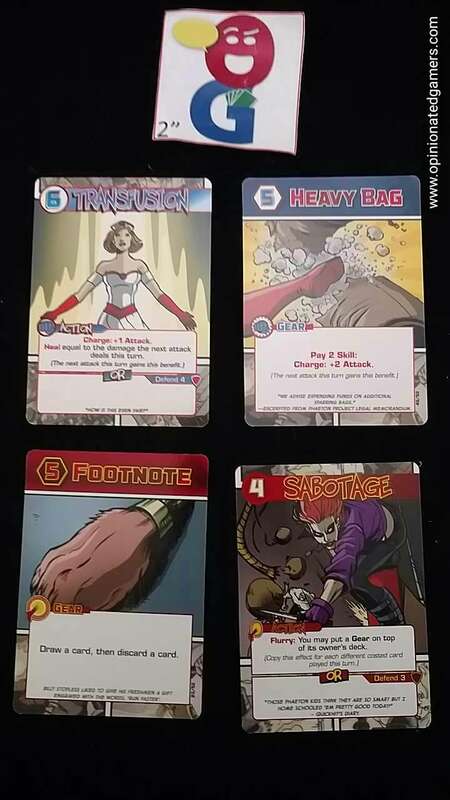 In this game, it should be no problem to look up any terms that come up because all the cards are revealed in the Page first, so all players will have a chance to read a new card – whether they buy it or it goes into the deck of an opponent. However, during our first games, it became apparent that the rules did not offer enough explanation of the important terms on the card. There were multiple actions which were not really explained well, even in the “Glossary” at the end of rulebook. For instance, it took us about two games to figure out what a Flurry was – and this is an action that comes up on a bunch of cards. For a game that relies upon the card text, there are way too many terms which need to be clearer in the rulebook. The starting player penalty of 3HP makes sense as that player has a slight advantage over the course of the game because they will on average get more turns. However, it doesn’t make sense that all the other players start on the same footing. After all, the second player in turn order will still get more turns on average than the third and fourth position. Having there be a constantly decreasing penalty would have made more sense from a balancing perspective. The game also allows for the group to gang up on a player – and, in fact, it makes the most sense to do so. Once someone is attacked, they might spend some of their cards to block or counterattack. However, when the next player goes, that attacked player hasn’t had a chance to draw new cards, so it makes sense to keep attacking that player because he likely doesn’t have any defense cards left. And so on around the table – everyone should attack the same guy because he doesn’t have any defense. Then… when his turn comes up, he’ll also be out of cards to use on his own turn as they’ve all been spent in defense. So, then that player can’t come up with a good attack, and then it’s back to being piled on again as play goes around the table. It doesn’t make sense to switch targets because all the other players have likely been able to buy useful cards from the tableau and they would be expected to have better defense cards at that point. The rules are hit-and-miss. The basic rules were easy to grasp for me given the similarities with other deck builders. There are a lot of illustrations and examples to help you understand the game. One thing which I didn’t get though is the mismatch of the pictures to the examples. When explaining a certain rule, they show you a card which helps you visualize the card in question, but then the text explanation explains that same rule using a different card. Sure, maybe you get two examples in the rules, but it’s really just confusing when you’re expecting the explanation to go with the graphic – which is what I think most people would expect. The other thing that’s weird is that a fairly important rule – when to replace a card on the Page – is somewhat hidden in an italic Note rather than in the main body of the text. I missed this rule repeatedly when trying to learn the game. I had assumed the correct rule based on previous deckbuilding experience, but it took me three passes through the rulebook to actually find the rule to confirm. Components are OK. The card stock is pretty sturdy, and I see no wear issues though our first few plays. I will admit that it’s a bit chintzy to give you a HP marker but then nothing to actually mark it with. It’s kind of not a big deal to go find some spare coins or cubes (or dice in our case), but at the same time, it really feels like this is a component that should have been included in the game box for you. The artwork though is quite good. Though I’m not a comic book guy myself, it appears that much of the art is done by accomplished comic illustrators, and it’s all really good work. I could easily imagine a comic book based on the story that underpins the game – and to be honest, until I did some research on the Web, I really did think that there was a comic! Overall, this is an interesting excursion into the world of the deckbuilding game. In many ways, it will feel familiar with the drawing, playing, shuffling and drawing. The different end point is a nice breath of fresh air and is a nice contrast to other deckbuilders. Though the game involves some player elimination, the game is quick enough that I don’t know if this is an issue – though in all of my early games, the group has decided to pile upon someone just to get them out of the game. The game fits in a small box (as there are not many cards), making the game eminently portable which is something that cannot be said of many deckbuilders. Pull it out, have a nice melee fight, and then put it all back in the small box. Be prepared to make up some ruling for terms/cards that aren’t explained in the rulebook. Left to my own devices though, I’d rather take a bigger box and play a more complete game (both ruleswise and components wise). Craig V (1 play): I don’t really have any favorable thoughts about Emergents: Genesis – The Deckbuilding Game to share, so I will keep this brief… This game is essentially Ascension, but players are attacking other players rather than attacking things that appear in the common row. Players can gain cards that can be used to Defend or Counter attacks, but a very large amount of the remaining gaming is no different than Ascension or any other pure deck-building game. The artwork is nice, but the theme is lacking depth and feels disjointed. The game is also missing everything needed to actually play since it does not come with the necessary components track health and other items during play. It may be possible to look past some of what I have mentioned so far, but the worst part is that the rules for game are missing very important information, does a poor job of explaining key terms, and includes little clarification regarding specific card effects. Examples of this include the fact that playing cards out during on a turn is called a “Flurry” and that starting cards actually have a cost of zero and are even. This crucial information not included in the two locations that attempt to explain game play, the glossary, or the limited FAQ. There is also nothing in the game that prevents several players from ganging up on another. Overall, I did not enjoy playing Emergents: Genesis – The Deckbuilding Game and can’t recommend the game.